Come on a journey to discover Lake Kivu’s spectacular ‘Bay of Islands’. Paddling through the deep azure waters we island hop past uninhabited islands – including Napoleon island with its famous bat colony. We spend the night camping on another beautiful, uninhabited island, which is still mostly covered with natural woodland and so teams with birdlife. 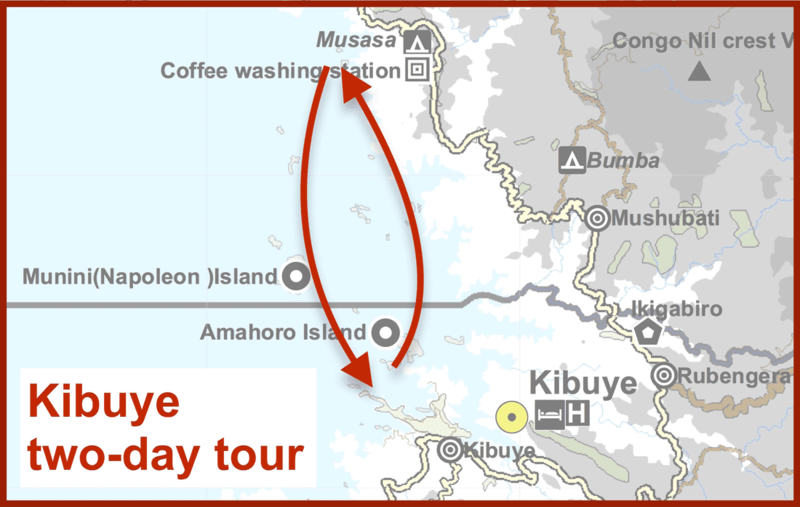 We return to Kibuye, via the coast and call into Amohoro Island for lunch. setting unlike anywhere else in the country. We then ‘island hop’, stop off for lunch and a swim in the crystal clear and impressively clean, fresh water to cool off. In the afternoon, we visit Napoleon Island where there is a remarkable (and noisy) colony of thousands of fruit bats that fight amongst themselves for the best roost. It’s then just a short paddle to our campsite, on another beautiful uninhabited island that is still covered with native trees that provide a rare haven for numerous species of birds dart in and out of the foliage. With exclusive access on the island, we set up camp, buy fish for dinner from local fishermen – so supporting a local community – and cook our own, simple but delicious meal, which we can provide for you, around a small open fire. Day 2: After a simple breakfast, we turn back towards Kibuye, this time following the coast where we have superb views of the lush mosaic of crops on small farms that make Rwanda’s hills so special. Before reaching Kibuye, we call in for lunch on Amohoro (Peace) Island, where there will be time to contemplate just how special the past couple of days have been. Then, in the afternoon it’s just a short paddle back to where we began; was it only yesterday? We can make reservations for you in Cyimbiri and Kinunu, however, accommodation and food as well as any additional activities are not included in the price charged by Kingfisher Journeys, except where specifically mentioned. You will need a tent and other camping equipment on the island, which can be hired from us, or you can bring your own. There is also a camping fee on the island (included in the price above), separate to the tent hire. We will loan you free dry bags for your clothing and valuables. Dinner on the camping island: we prepare for you a delicious simple meal on the open fire. We also supply a simple lunch on the last day. If you deselect this option, you will need to bring all your own food and cooking equipment.